We usually devote one large bed on our plot to dahlias. After many years of keeping tubers over winter either in the ground or digging them up and storing, we decided that we would just grow dahlias from seed each year. We don't grow special varieties, we just really want some cut flowers for the house and so trying to overwinter tubers is just too much hassle. Growing from seed we can have a change of colours and flower style each year - this year we're trying pompoms. Like everything else the plants are behind but many now have developed flower buds - some of which are beginning to open. Growing from seed we have the extra anticipation of finding out what colours we end up with. We could have done to have sown the seed a bit more thinly as so far this is how it looks. We also planted so sweet peas - a free packet of seed and some sunflowers. Coincidentally there is lots of phaecelia in the mix which Martyn grew earlier as a green manure. I'm hoping lots of these flowers will seed themselves and produce an even better display next year - I do hope the bees enjoy them. Five cloves of elephant garlic were included in the collection of garlic that we bought last year. I planted three in pots to be planted out in early spring and two cloves were planted directly in the ground. Other varieties of garlic were pulled earlier as they were suffering from rust and the foliage had died back. 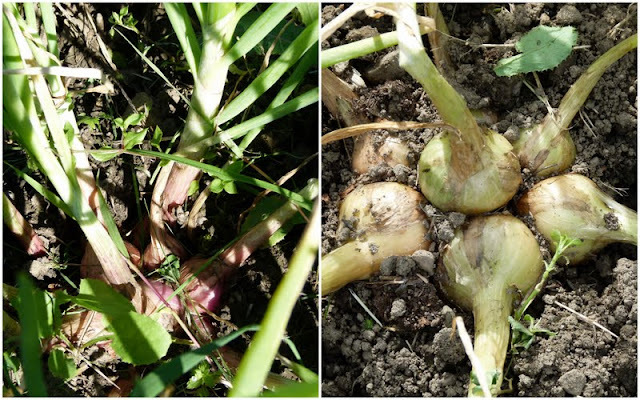 The foliage of the directly planted elephant garlic didn't suffer in the same way and so I left them to grow on. They have now been lifted and have produced some good sized bulbs. Just like the 'real' garlic - the directly planted elephants have grown better than the ones that were transplanted. Like others have reported there were some small bulbils attached to the main bulbs so maybe I'll plant these and see what happens. Our success has encouraged us to order more cloves to plant next year. Now we just need to decide how to use this year's bulbs. Elephant garlic isn't truly a garlic at all but more closely related to a leek. The flavour is supposed to be like a mild garlic and I understand that they are good roasted whole or even used raw in a salad. I wonder whether we should eat them on a day when we will not be in anyone else's company! Do you remember the lovely mophead hydrangea that a friend bought us as a summerhouse warming gift? It has been really beautiful but surprisingly it isn't the flowers that are the most attractive part of the plant. The tiny four petalled flowers sit in the centre of a ring of larger bracts and are fairly insignificant. 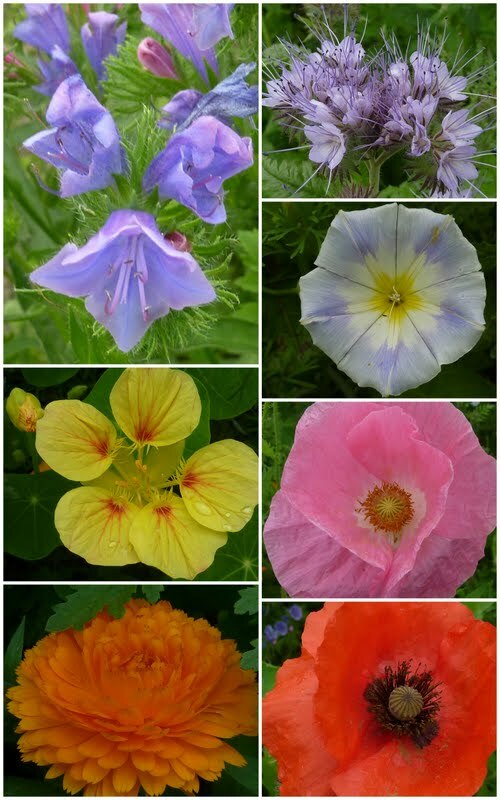 The bracts are modified leaves and it is they that actually provide the colourful display. You may remember that, last year, I bought another type of hydrangea to plant in my white and blue border. I wanted hydrangea quercifolia which luckily a local nursery managed to source for me. (Sadly for us this nursery is closing at the end of September as the owners are retiring. With few 'real' nurseries remaining they will be very much missed). I'm really pleased with how this plant is growing as I didn't expect it to flower in its first year but it has produced plenty of clusters of 'flower' heads although the rain has spattered the bracts spoiling them a little. The leaves of quercifolia should have good autumn colour but last year the leaves stayed green so I'm looking forward to seeing what happens next winter. PS - Only two more days left to enter the sudoku competition. Can you believe that it is almost August!!! Is this the start of the expected glut? Last year we picked our first courgette from the plot on 11 July. This year things were not looking too promising as the first courgette to be planted out soon looked very much worse for wear. The first lot planted on 10 June, shown on the right of the photo, soon started to yellow and look very sickly. A couple just lay flat and sorry for themselves. They certainly didn't look as though they would make it. So we did what any good gardener would do and planted lots more. The rationale was that there would be the chance that a couple would survive. We sowed three varieties - this year we tried to restrict ourselves to just two namely Zucchini (green) and Jemmer (Yellow) but then as is usually the case a free packet of Tondo di Piacenza (a round variety) arrived in a magazine and the temptation to sow proved just too great. Surprisingly the dead looking plants rallied - they wouldn't have if we hadn't planted lots more would they? Note in the photo below a couple of dead looking specimens on the top left - would you have expected them to survive? Well they have! Although small, the plants started to produce flowers and baby fruits looked to be setting. Courgettes do tend to suddenly surprise you by appearing seemingly from nowhere and yesterday we picked our first two fruits. One Zucchini and one Tondo di Piacenza. So 14 days later than last year we have our first picking. Is this going to be the start of the mother of all gluts or will the small plants just not be able to support the usual fruiting frenzy? Like us, you will just have to wait and see. 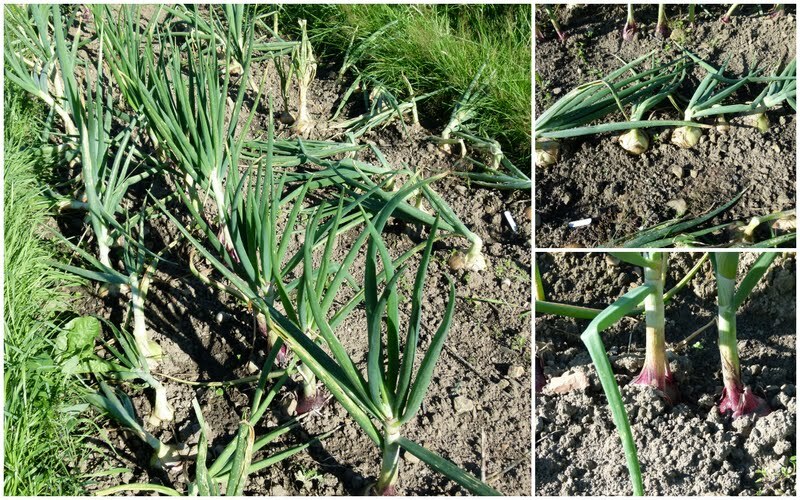 Our full harvesting list for July is being published here and Martyn has posted about our autumn sown onions, comparing yields from different varieties here. If you don't live in the UK you won't believe my next statement; yesterday it was too hot to go to the plot! We had intended to get a second afternoon weeding and tidying at the allotment but decided that if we did we would probably fry - and so we stayed in the garden to mooch about a little. Martyn's mooching was a bit more productive than mine as I spent time mainly doing very little. This time the summerhouse was actually used as a shady place to sit rather than as a shelter. I did venture out though and take a few photos which I will sprinkle in between other posts over the next few days or so. This is a photo taken of the underside of one of our ferns - I think it's a lady fern. Episode two - On the Plot. Episode 2 in my allotment soap features the area of our plot that house both the greenhouse and the shed. The shed has earned its keep this year and provided us with a refuge during the frequent downpours. Note the patchwork patio! Wrapping round the shed a chicken wire 'fence' supports the tayberry which would have provided us with lots of berries had the constant rain not only spoiled many but prevented us from getting to the plot frequently enough to pick them quickly after they had ripened. At the back of the shed, alongside the tayberry is a grapevine. The intention is to train this along two sides of the shed but we haven't managed to get round to this yet. I haven't noticed any fruit buds although a second vine planted elsewhere on the plot does have some baby fruits - which I guess will stay baby sized! The tomatoes in the greenhouse are beginning to set one or two fruits - the plants look healthy enough but there hasn't been a whole lot of flowering going on. At least we haven't had to worry about watering them too regularly. Much of this area of the plot is given over to fruit. There are a couple of cranberries in tubs outside the greenhouse - one has set fruit and the other is beginning to produce a few flowers - very weird as they are the same variety and only a greenhouse door width apart! The bed nearest to the shed contains four blueberries - the berries ripen at slightly different times - the first bush has fruit beginning to turn. The trouble is that the fruit is ready a few berries at a time which if left to fully ripen will fall victim to birds. We can't net the entire plot and so I pick the berries slightly under-ripe as I find they ripen quickly off the bush and the flavour doesn't appear to be affected. Behind The blueberry bed are three pear trees which in spite of setting fruit now don't have a single pear to their name! This bed is planted up with annual flowers which should be creating a bit of colour by now but are failing miserably. Beyond the pear trees are a couple of beds containing rhubarb, gooseberries, whitecurrants, jostaberries, alpine strawberries and a Glencoe raspberry. Whilst most of these fruits are providing a harvest - the jostaberry at first glance is fruitless. Maybe there are some fruits camouflaged amongst the leaves that will show themselves once they ripen but I doubt it. The next bed contains the broad beans which after a poor start are doing well. Even the plants that looked pathetic when first planted have rallied and are providing a crop. Martyn was ready to rip them out but I pleaded a second chance for them and they have repaid my confidence in them. Alongside the beans is the onion and the shallot bed. The onions seem to be picking up a little but that may just be wishful thinking. To provide a boundary - we're not allowed fences - we have planted a shrub and perennial bed along the edge of this part of the plot. As you can see this area is in desparate need of weeding but at the moment we are concentrating on weeding beds planted with edibles. Level with the onion bed is a bed of potatoes although to look at it you would never know. For some reason these never really got going and they haven't really produced much of a crop. The bed alongside the broad bean is a brassica bed in which the slugs and snails have had a field day. It is netted against butterflies and birds but the slimy intruders don't respect netting. It had also become very weedy which was providing an ideal sluggy environment. This has now been weeded and the slimy, squatters - that I came across, have been evicted. We will just have to see whether the lacy brassicas produce anything edible. Next comes the inherited apple hedge. Although lots of apples have set these don't seem to be growing. Behind the apple hedge are some young apple trees which also have slowly developing fruits. Alongside the apples the redcurrants are protected under a makeshift fruit cage. We have harvested quite a lot of fruit from these bushes and will soon let the blackbirds and thrushes in so they can take their share. Finally in this section is our large rhubarb bed. The sprig growing behind the greenhouse is a plum sucker or self sown plum tree that needs dealing with. I did take far more photos and so if you still want to see more - well done for sticking with me so far - then browse the album below! Last year we grew some Carouby de Maussane, mangetout peas. We were disappointed in that the plants that are supposed to grow to five feet just didn't seem to grow at all and the pods were disfigured. We decided that the dry conditions last year, (and we thought that was bad! ), were hardly a good trial of any pea variety and so decided to give it another chance this year. This year the peas have been slow to get going but have now almost reached the expected five feet and have started to crop. Note the rain drops! In April the first lots of seeds were sown in pots and then planted out as small plants. There was a point when we thought the plants weren't growing too well and so I sowed an outer ring of seeds directly in the ground forming an outer ring which you may be able to make out from the photo below. Then - wouldn't you just know it - of course the earlier plants took off. Maybe the later sown plants will rear up to take over once the first lot are over. If so I think I may have invented a new growing technique! Must admit I was attracted to the variety by the description in the seed catalogue "Tall growing mangetout variety with attractive purple flowers. Large pods up to 11cm long. Good sweet flavour. Height 150cm." I have to say though so far I'm a bit disappointed by the flowers. Although individually they are pretty they don't give the dramatic display that I probably unreasonably expected. I say unreasonably as I know pea flowers don't tend to open fully. There is a sort of flare of purplish red around the area where the leaves join the stems which adds a little more colour to the plant but ... they are nothing like this. But then again sweet peas don't produce anything edible so I guess honours are pretty even. I don't think I've ever posted a photo of the flower bed under our John Downie crab apple and as it seems to be thriving this year I thought it was time that I did. Must admit that it is a bit of a mish mash as I've just plonked plants in where there was a gap rather than having some sort of planting plan. Plants just jumble up into one another and at one end is what we call the puddle. It's a mini pond measuring about 70cm by 50cm that was added to provide an additional drinking hole for birds and hedgehogs and also a bathing area for birds. There's more about how this bed came into being on my website page here. Anyway I've drifted off track so back on the rails - I have decided that I will split my update of what is happening on the plot into sections. An episode for each area. After a good weekend harvesting, tidying and weeding, the area of the plot that I am going to feature in episode one is looking fairly neat and tidy (except I seem to have missed the area around where the cucumbers are planted). Martyn and I are often gardening in very different parts of the plot and have to search for one another but Sunday we both concentrated our efforts on this part. If you browse the photo album you can take the tour. Our plot ends behind the far lavender border - our neighbour has grass paths and a similar style to our plot and so you may be deceived into thinking that everything you can see in the distance is a continuation of our plot. We are harvesting raspberries and blackcurrants from this area and some of our gooseberries. The strawberry bed that was set out last year and the runners planted this year are also in this part of the plot. Unfortunately after a great start to our strawberry harvest the rain is spoiling lots of the fruit. I just hope we soon have less rain and more strawberries. There are borders of alpine strawberries which seem less susceptible to rain damage and providing some pickings. A salad bed planted up with radish, beetroot, spring onions, celeriac, celery and the odds and ends of left over onion sets is in this section of plot. For some reason we have had trouble growing spring onions - not just this year either so we can't blame the weather. The bed of recently planted leeks seem to be doing well and the sweetcorn growing close by also seems to be now growing away strongly. It looks better than last year when it didn't like the dry conditions at all. Growing up bamboo teepees in the same bed as the sweetcorn are mangetout and runner beans. French beans also share this bed. After planting the beans were looking a bit shabby but surprisingly they have started to look better and are even starting to flower - now whether the flowers will actually set beans is another matter. We are harvesting mangetout which we didn't managed to do at all last year. Like the sweetcorn, they didn't enjoy the dry conditions last year and any pods that did form were disfigured and mildewy. In the centre of this area potatoes - Winston, Nadine, Nicola and Charlotte are growing well. Courgettes are looking better and seem to have some 'fruits' set. We planted lots of courgettes as we thought that they had little chance of survival but we could end up regretting this if they all produce a crop. The sweet peas are thriving and producing masses of flowers which need cutting regularly in order to keep them going. On the opposite side of the sweetpea frame outdoor cucumbers are planted which if they survive will be trained up the bamboo struts. So far the cucumbers are still alive so maybe we will be lucky and have some sort of a harvest. Just a few photos to update on the state of the front garden bed. I've been really pleased with how this has turned out. I chose plants to try and extend the interest for as long as possible rather than to have a complete blast of colour that was short lived and this seems to have worked. The crocuses (crocii - if you prefer) started to flower in February and since then there has always been something to look at from our the vanatage point of our front window. Looking back I also have flower photos from last November but as we didn't really have any frosts until later maybe this won't be repeated this year. I did lose one or two plants - as I suspected salvia Amistad wasn't fully hardy and I also lost a couple of veronicas. There were still one or two gaps where yesterday I planted three coreopsis - they have been in the greenhouse trying to grow a little bigger but (like everything else) struggling with this so I decided to plant them out anyway and I'm also going to add more spring bulbs. If you want to see pictures of how this bed progressed from start to finish I have a page on my website here which may be of interest. Will we be crying over our onions? There are three varieties here the nearest are Fen Early, then the small ones are Hyred with Hytech the furthest away. Hyred are making the least progress and have also managed to produce a couple of flower buds in spite of the heat treatment. Last year quite a lot of onions rotted in storage and so we decided to add a few more to our planting schedule and bought some non-heated treated varieties, Snowball and Setton earlier in the year. These were planted in pots in the cold greenhouse in February and planted out in March. As it happens they may be our saving grace .. maybe. At least they managed to get growing before the horrible weather really set in. Setton are probably stronger growing than Snowball which produces a white onion. Snowball has also been the vatiety that has produced the most flower stems. The weather conditions this year have made onions bolt far more than usual. The warmer periods earlier in the year followed by the drop in temperature in June fooled that plants into thinking summer was over which triggered the production of flower stems. Each time I have visited the plot I have been snapping off the buds. The buds need to be snipped off immediately below the bud leaving the stem in place. Removing the stem or cutting it further down leaves a hollow tube which can gather water and lead to rotting as it is onions that develop a flower stem can end up with a woody centre. We are also growing two varieties of shallots, Yellow Moon and Picasso. Like Snowball, Yellow Moon has produced a huge number of flower buds whereas Picasso like Setton has produced none. If I was ever in any doubt about how worthwhile it was to plant overwintering onions then this year would have dispelled them. We are harvesting these now. We planted four varieties, Electric, Shakespeare, Senshyu and Autumn Champion. This harvest picked up where the stored onions left off - it's such a pity that overwintered varieties won't store but at least it means that at least one aspect of our onion growing hasn't ended in tears. So how did our garlic grow?